SilverDoctors: Gold Over EUR 1,300 - On Way to ‘Infinity’ on Eurozone Contagion? Gold Over EUR 1,300 - On Way to ‘Infinity’ on Eurozone Contagion? Gold is trading at USD 1,783.10, EUR 1,307.50, GBP 1,116.30, CHF 1,612.20, JPY 138,315 and CNY 11,309 per ounce. Gold’s London AM fix this morning was USD 1,780.00, GBP 1,112.50, and EUR 1,300.41 per ounce. 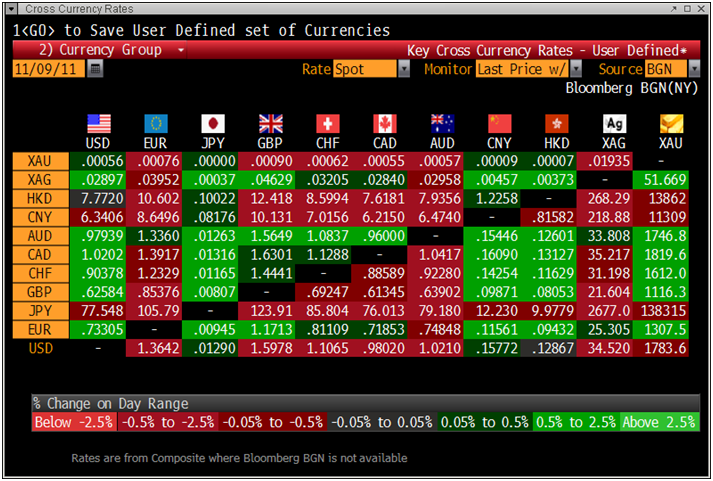 Yesterday's AM fix was USD 1,794.00, GBP 1,114.49, and EUR 1,301.51 per ounce. Risk has returned with a vengeance as Italian debt markets have gone into meltdown leading to falls in European equity indices. Gold remains near a seven week high and has risen to above EUR 1,305/oz due to the deepening Eurozone crisis and contagion risk. Deepening geopolitical tensions regarding Iran, Israel and the western world has led to oil rising for six days in a row now and this is also supporting gold. The International Atomic Energy Agency said Iran was developing nuclear-weapons capabilities that gave it "serious concern" about possible military aspects to Iran’s nuclear programme. Italy’s bond markets are heading the way of Ireland, Greece and Portugal with their 10 year bond yield surging to over 7.45% and the yield curve inverting with the 2 year yield rising above the 10 year. China's gold consumption continues to surprise even bullish analysts. China's gold consumption is expected to jump nearly 50% to reach 400 tonnes this year. Thus exceeding the country's forecast of more than 350 tonnes. 400 tonnes compares to just 270 tonnes in 2010 which was itself a record month. Official Chinese annual consumer inflation numbers showed an easing to 5.5% from September's 6.1%. The savings rate (1 year) is at 3.5% meaning steep negative real interest rates continue in China which is bullish for continuing Chinese gold demand. So far, gold has not managed to rise above the psychologically important $1,800 level. However, the real risk of contagion in the eurozone and the breakup of the European monetary union means that gold’s safe haven properties will be increasingly appreciated in the coming months. While much of the media attention has been on the political ‘punch and judy’ show in Athens, Rome, and in the European Union there continues to be a failure to soberly analyse the ramifications of the crisis for consumers, investors and savers. The unprecedented scale of the debt crisis means that inflation and currency devaluations will almost certainly result from the crisis. Savers and those on fixed incomes will be very vulnerable as they were in the stagflation of the 1970s and in the economic meltdowns seen in Argentina, Russia, and in Belarus as we speak. All the focus has shifted from Greece to Italy recently and markets and media have focused on the Eurozone debt crisis. However, the US is itself facing a debt crisis which is also of a monumental scale. It is so large that it cannot be resolved by the usual kneejerk resorting to the printing presses and today’s equivalent panacea - computer credit creation. The US National Debt will likely reach $15 trillion by the end of this week. Some estimates of unfunded liabilities are over $116 trillion. The US has similar issues to the many debt stricken countries of the Eurozone. One of the few sane voices for many years regarding the dangers of excessive private and public debt has been Presidential candidate Ron Paul. 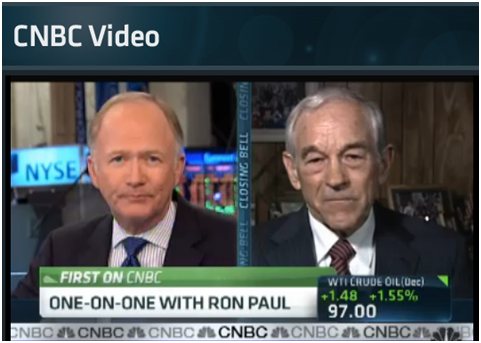 Ron Paul gave another perceptive interview to CNBC yesterday and warned of hyperinflation and the possibility that the dollar could become worthless. The CNBC interview can be watched here. We do not make price predictions but given the scale of the current global debt crisis it would be naïve to completely discount the possibility of sharp devaluations of the euro, the dollar and the pound and gold surging well above the inflation adjusted high of $2,500/oz in dollar and pound terms and equivalent prices in euros. It is not too late to diversify and never has it been more important to be prudent. Platinum is trading at $1,645.70/oz, palladium at $660.80/oz and rhodium at $1,525/oz.